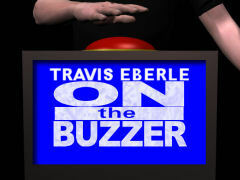 Opinions expressed in On the Buzzer do not necessarily reflect those held by Game Show Newsnet as a whole. I Want My Game TV! Over the weekend, the MTV network celebrated a landmark anniversary, but you wouldn't know it from the network itself. MTV turned 30, but to see the celebration you had to tune your television to VH1 Classic. On my set, this channel is in the 400s. To me this seems a little bit like not showing up to your own birthday party. The problem with indulging is that you expose your regular viewers, who have been subsisting on a steady diet of Jersey Shore and a long parade of Dating Game/Bachelor permutations, would be gobsmacked to know that once the network played wall to wall music videos, or at least content pertaining to music. Maybe the viewers would revolt, demand quality programming instead of the pablum they're getting now. Maybe they wouldn't care either way. Who knows. So what does the ignored anniversary of a cable network have to do with game shows? MTV is analogous to the boiling frog. To kill a frog, you don't dump it in boiling water; he'll jump out and no frogs legs for you that night. Instead you put the frog in ambient water, and you gradually turn up the heat so that Kermit won't know the difference. Game Show Network started the same way. Originally a twenty-four hour, seven-day-week wall-to-wall smorgasbord of classic game shows, the channel has made its way through adolescence, worse for the wear. Just like a teenager who is looking to fit in, to find herself, Game Show Network has gone through phases. There was the period were reality show reruns and card games ruled the day. There were the various originals which ran the gamut from excellent to awful. And all the while the show has never really settled into a groove except for what they don't want to acknowledge, which is that their strength is in the reruns. Their bread is buttered on $25,000 Pyramid, Family Feud and Match Game, not on Love Triangle, Deal or No Deal or Without Prejudice. For reasons I don't quite understand, GSN refuses to do this, they prefer to try new things every couple of years, stubbornly clinging to a failing philosophy that won't ever pay off. Game Show Network won't ever be anything but a quirky third-tier niche network, but they could be doing themselves a whole heap of good things by embracing what they are: put on some reruns that people will watch and enjoy, and some original programming that stays with the brand message, and doesn't turn off the core audience.